"Arsacid dynasty" redirects here. For other uses, see Arsacid dynasty (disambiguation). The Parthian Empire (/ˈpɑːrθiən/; 247 BC – 224 AD), also known as the Arsacid Empire (/ˈɑːrsəsɪd/), was a major Iranian political and cultural power in ancient Iran. Its latter name comes from Arsaces I of Parthia who, as leader of the Parni tribe, founded it in the mid-3rd century BC when he conquered the region of Parthia in Iran's northeast, then a satrapy (province) under Andragoras, in rebellion against the Seleucid Empire. Mithridates I of Parthia (r. c. 171–138 BC) greatly expanded the empire by seizing Media and Mesopotamia from the Seleucids. At its height, the Parthian Empire stretched from the northern reaches of the Euphrates, in what is now central-eastern Turkey, to eastern Iran. The empire, located on the Silk Road trade route between the Roman Empire in the Mediterranean Basin and the Han dynasty of China, became a center of trade and commerce. It is unclear who immediately succeeded Arsaces I. Bivar and Katouzian affirm that it was his brother Tiridates I of Parthia, who in turn was succeeded by his son Arsaces II of Parthia in 211 BC. Yet Curtis and Brosius state that Arsaces II was the immediate successor of Arsaces I, with Curtis claiming the succession took place in 211 BC, and Brosius in 217 BC. Bivar insists that 138 BC, the last regnal year of Mithridates I, is "the first precisely established regnal date of Parthian history." Due to these and other discrepancies, Bivar outlines two distinct royal chronologies accepted by historians. A fictitious claim was later made from the 2nd-century BC onwards by the Parthians, which represented them as descendants of the Achaemenid king of kings, Artaxerxes II of Persia (r. 404 – 358 BC). For a time, Arsaces consolidated his position in Parthia and Hyrcania by taking advantage of the invasion of Seleucid territory in the west by Ptolemy III Euergetes (r. 246–222 BC) of Egypt. This conflict with Ptolemy, the Third Syrian War (246–241 BC), also allowed Diodotus I to rebel and form the Greco-Bactrian Kingdom in Central Asia. The latter's successor, Diodotus II, formed an alliance with Arsaces against the Seleucids, but Arsaces was temporarily driven from Parthia by the forces of Seleucus II Callinicus (r. 246–225 BC). After spending some time in exile among the nomadic Apasiacae tribe, Arsaces led a counterattack and recaptured Parthia. Seleucus II's successor, Antiochus III the Great (r. 222–187 BC), was unable to immediately retaliate because his troops were engaged in putting down the rebellion of Molon in Media. Parthian Empire timeline including important events and territorial evolution. Phraates I is recorded as expanding Parthia's control past the Gates of Alexander and occupied Apamea Ragiana. The locations of these are unknown. Yet the greatest expansion of Parthian power and territory took place during the reign of his brother and successor Mithridates I of Parthia (r. c. 171–138 BC), whom Katouzian compares to Cyrus the Great (d. 530 BC), founder of the Achaemenid Empire. Relations between Parthia and Greco-Bactria deteriorated after the death of Diodotus II, when Mithridates' forces captured two eparchies of the latter kingdom, then under Eucratides I (r. c. 170–145 BC). Turning his sights on the Seleucid realm, Mithridates invaded Media and occupied Ecbatana in 148 or 147 BC; the region had been destabilized by a recent Seleucid suppression of a rebellion there led by Timarchus. This victory was followed by the Parthian conquest of Babylonia in Mesopotamia, where Mithridates had coins minted at Seleucia in 141 BC and held an official investiture ceremony. While Mithridates retired to Hyrcania, his forces subdued the kingdoms of Elymais and Characene and occupied Susa. By this time, Parthian authority extended as far east as the Indus River. Antiochus VII Sidetes (r. 138–129 BC), a brother of Demetrius, assumed the Seleucid throne and married the latter's wife Cleopatra Thea. After defeating Diodotus Tryphon, Antiochus initiated a campaign in 130 BC to retake Mesopotamia, now under the rule of Phraates II of Parthia (r. c. 138–128 BC). 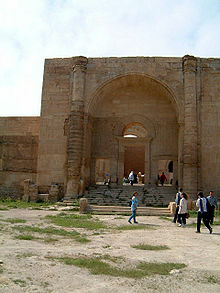 The Parthian general Indates was defeated along the Great Zab, followed by a local uprising where the Parthian governor of Babylonia was killed. Antiochus conquered Babylonia and occupied Susa, where he minted coins. After advancing his army into Media, the Parthians pushed for peace, which Antiochus refused to accept unless the Arsacids relinquished all lands to him except Parthia proper, paid heavy tribute, and released Demetrius from captivity. Arsaces released Demetrius and sent him to Syria, but refused the other demands. By spring 129 BC, the Medes were in open revolt against Antiochus, whose army had exhausted the resources of the countryside during winter. While attempting to put down the revolts, the main Parthian force swept into the region and killed Antiochus in battle. His body was sent back to Syria in a silver coffin; his son Seleucus was made a Parthian hostage and a daughter joined Phraates' harem. Drachma of Mithridates II of Parthia (r. c. 124–90 BC). Reverse side: goddess Tyche/Khvarenah holding a small Nike offering a wreath; inscription reading [ΒΑΣΙΛΕΩΣ] ΑΡΣΑΚΟΥ ΕΠΙΦΑΝΟΥΣ ΦΙΛΕΛΛΗΝΟΣ "of Renowned/Manifest [King] Arsaces the Philhellene. While the Parthians regained the territories lost in the west, another threat arose in the east. In 177–176 BC the nomadic confederation of the Xiongnu dislodged the nomadic Yuezhi from their homelands in what is now Gansu province in Northwest China; the Yuezhi then migrated west into Bactria and displaced the Saka (Scythian) tribes. The Saka were forced to move further west, where they invaded the Parthian Empire's northeastern borders. Mithridates was thus forced to retire to Hyrcania after his conquest of Mesopotamia. Some of the Saka were enlisted in Phraates' forces against Antiochus. However, they arrived too late to engage in the conflict. When Phraates refused to pay their wages, the Saka revolted, which he tried to put down with the aid of former Seleucid soldiers, yet they too abandoned Phraates and joined sides with the Saka. Phraates II marched against this combined force, but he was killed in battle. The Roman historian Justin reports that his successor Artabanus I of Parthia (r. c. 128–124 BC) shared a similar fate fighting nomads in the east. He claims Artabanus was killed by the Tokhari (identified as the Yuezhi), although Bivar believes Justin conflated them with the Saka. 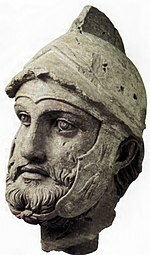 Mithridates II of Parthia (r. c. 124–90 BC) later recovered the lands lost to the Saka in Sistan. 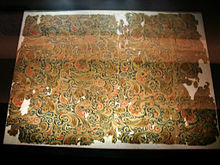 Han-dynasty Chinese silk from Mawangdui, 2nd century BC, silk from China was perhaps the most lucrative luxury item the Parthians traded at the western end of the Silk Road. The Indo-Parthian Kingdom, located in modern-day Afghanistan and Pakistan made an alliance with the Parthian Empire in the 1st century BC. Bivar claims that these two states considered each other political equals. After the Greek philosopher Apollonius of Tyana visited the court of Vardanes I of Parthia (r. c. 40–47 AD) in 42 AD, Vardanes provided him with the protection of a caravan as he traveled to Indo-Parthia. When Apollonius reached Indo-Parthia's capital Taxila, his caravan leader read Vardanes' official letter, perhaps written in Parthian, to an Indian official who treated Apollonius with great hospitality. Following the diplomatic venture of Zhang Qian into Central Asia during the reign of Emperor Wu of Han (r. 141–87 BC), the Han Empire of China sent a delegation to Mithridates II's court in 121 BC. The Han embassy opened official trade relations with Parthia via the Silk Road yet did not achieve a desired military alliance against the confederation of the Xiongnu. The Parthian Empire was enriched by taxing the Eurasian caravan trade in silk, the most highly priced luxury good imported by the Romans. 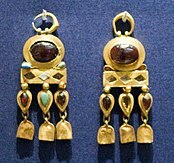 Pearls were also a highly valued import from China, while the Chinese purchased Parthian spices, perfumes, and fruits. Exotic animals were also given as gifts from the Arsacid to Han courts; in 87 AD Pacorus II of Parthia sent lions and Persian gazelles to Emperor Zhang of Han (r. 75–88 AD). Besides silk, Parthian goods purchased by Roman merchants included iron from India, spices, and fine leather. 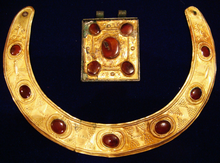 Caravans traveling through the Parthian Empire brought West Asian and sometimes Roman luxury glasswares to China. The merchants of Sogdia, speaking an Eastern Iranian language, served as the primary middlemen of this vital silk trade between Parthia and Han China. The Yuezhi Kushan Empire in northern India largely guaranteed the security of Parthia's eastern border. Thus, from the mid-1st century BC onwards, the Arsacid court focused on securing the western border, primarily against Rome. 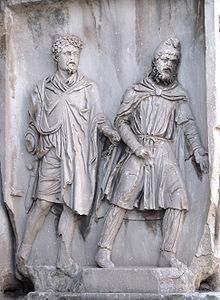 A year following Mithridates II's subjugation of Armenia, Lucius Cornelius Sulla, the Roman proconsul of Cilicia, convened with the Parthian diplomat Orobazus at the Euphrates river. The two agreed that the river would serve as the border between Parthia and Rome, although several historians have argued that Sulla only had authority to communicate these terms back to Rome. Despite this agreement, in 93 or 92 BC Parthia fought a war in Syria against the tribal leader Laodice and her Seleucid ally Antiochus X Eusebes (r. 95–92? BC), killing the latter. When one of the last Seleucid monarchs, Demetrius III Eucaerus, attempted to besiege Beroea (modern Aleppo), Parthia sent military aid to the inhabitants and Demetrius was defeated. Following the rule of Mithridates II, Gotarzes I ruled Babylonia, while Orodes I (r. c. 90–80 BC) ruled Parthia separately. This system of split monarchy weakened Parthia, allowing Tigranes II of Armenia to annex Parthian territory in western Mesopotamia. This land would not be restored to Parthia until the reign of Sanatruces of Parthia (r. c. 78–71 BC). Following the outbreak of the Third Mithridatic War, Mithridates VI of Pontus (r. 119–63 BC), an ally of Tigranes II of Armenia, requested aid from Parthia against Rome, but Sanatruces refused help. When the Roman commander Lucullus marched against the Armenian capital Tigranocerta in 69 BC, Mithridates VI and Tigranes II requested the aid of Phraates III of Parthia (r. c. 71–58). Phraates did not send aid to either, and after the fall of Tigranocerta he reaffirmed with Lucullus the Euphrates as the boundary between Parthia and Rome. Tigranes the Younger, son of Tigranes II of Armenia, failed to usurp the Armenian throne from his father. He fled to Phraates III and convinced him to march against Armenia's new capital at Artaxarta. When this siege failed, Tigranes the Younger once again fled, this time to the Roman commander Pompey. He promised Pompey that he would act as a guide through Armenia, but, when Tigranes II submitted to Rome as a client king, Tigranes the Younger was brought to Rome as a hostage. Phraates demanded Pompey return Tigranes the Younger to him, but Pompey refused. In retaliation, Phraates launched an invasion into Corduene (southeastern Turkey) where, according to two conflicting Roman accounts, the Roman consul Lucius Afranius forced the Parthians out by either military or diplomatic means. Phraates III was assassinated by his sons Orodes II of Parthia and Mithridates III of Parthia, after which Orodes turned on Mithridates, forcing him to flee from Media to Roman Syria. Aulus Gabinius, the Roman proconsul of Syria, marched in support of Mithridates to the Euphrates, but had to turn back to aid Ptolemy XII Auletes (r. 80–58; 55–51 BC) against a rebellion in Egypt. Despite losing his Roman support, Mithridates managed to conquer Babylonia, and minted coins at Seleucia until 54 BC. In that year, Orodes' general, known only as Surena after his noble family's clan name, recaptured Seleucia, and Mithridates was executed. Marcus Licinius Crassus, one of the triumvirs who was now proconsul of Syria, launched an invasion into Parthia in 53 BC in belated support of Mithridates. 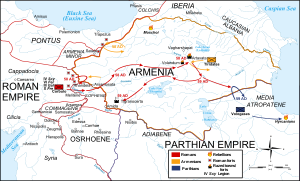 As his army marched to Carrhae (modern Harran, southeastern Turkey), Orodes II invaded Armenia, cutting off support from Rome's ally Artavasdes II of Armenia (r. 53–34 BC). Orodes persuaded Artavasdes to a marriage alliance between the crown prince Pacorus I of Parthia (d. 38 BC) and Artavasdes' sister. Surena, with an army entirely on horseback, rode to meet Crassus. Surena's 1,000 cataphracts, armed with lances, and 9,000 horse archers were outnumbered roughly four to one by Crassus' army, comprising seven Roman legions and auxiliaries including mounted Gauls and light infantry. Relying on a baggage train of about 1,000 camels, the Parthian horse archers were given constant supplies of arrows. The horse archers employed the "Parthian shot" tactic, where they would fake a retreat, only to turn and fire upon their opponents. This tactic, combined with the use of heavy composite bows on flat plain devastated Crassus' infantry. With some 20,000 Romans dead, approximately 10,000 captured, and roughly another 10,000 escaping west, Crassus fled into the Armenian countryside. At the head of his army, Surena approached Crassus, offering a parley, which Crassus accepted. However, he was killed when one of his junior officers, suspecting a trap, attempted to stop him from riding into Surena's camp. Crassus' defeat at Carrhae was one of the worst military defeats of Roman history. Parthia's victory cemented its reputation as a formidable if not equal power with Rome. With his camp followers, war captives, and precious Roman booty, Surena traveled some 700 km (430 mi) back to Seleucia where his victory was celebrated. However, fearing his ambitions even for the Arsacid throne, Orodes had Surena executed shortly thereafter. Emboldened by the victory over Crassus, the Parthians attempted to capture Roman-held territories in Western Asia. Crown prince Pacorus I and his commander Osaces raided Syria as far as Antioch in 51 BC, but were repulsed by Gaius Cassius Longinus, who ambushed and killed Osaces. The Arsacids sided with Pompey in his civil war against Julius Caesar and even sent troops to support the anti-Caesarian forces at the Battle of Philippi in 42 BC. Quintus Labienus, a general loyal to Cassius and Brutus, sided with Parthia against the Second Triumvirate in 40 BC; the following year he invaded Syria alongside Pacorus I. The triumvir Mark Antony was unable to lead the Roman defense against Parthia due to his departure to Italy, where he amassed his forces to confront his rival Octavian and eventually conducted negotiations with him at Brundisium. After Syria was occupied by Pacorus' army, Labienus split from the main Parthian force to invade Anatolia while Pacorus and his commander Barzapharnes invaded the Roman Levant. They subdued all settlements along the Mediterranean coast as far south as Ptolemais (modern Acre, Israel), with the lone exception of Tyre. In Judea, the pro-Roman Jewish forces of high priest Hyrcanus II, Phasael, and Herod were defeated by the Parthians and their Jewish ally Antigonus II Mattathias (r. 40–37 BC); the latter was made king of Judea while Herod fled to his fort at Masada. Despite these successes, the Parthians were soon driven out of the Levant by a Roman counteroffensive. Publius Ventidius Bassus, an officer under Mark Antony, defeated and then executed Labienus at the Battle of the Cilician Gates (in modern Mersin Province, Turkey) in 39 BC. Shortly afterward, a Parthian force in Syria led by general Pharnapates was defeated by Ventidius at the Battle of Amanus Pass. As a result, Pacorus I temporarily withdrew from Syria. When he returned in the spring of 38 BC, he faced Ventidius at the Battle of Mount Gindarus, northeast of Antioch. Pacorus was killed during the battle, and his forces retreated across the Euphrates. His death spurred a succession crisis in which Orodes II chose Phraates IV of Parthia (r. c. 38–2 BC) as his new heir. Drachma of Phraates IV of Parthia (r. c. 38–2 BC). Reverse side: Tyche/Khvarenah bestowing the attributes of power (palm, cornucopia) on the king; inscription ΒΑΣΙΛΕΩΣ ΒΑΣΙΛΕΩΝ ΑΡΣΑΚΟΥ ΕΥΕΡΓΕΤΟΥ ΕΠΙΦΑΝΟΥΣ ΦΙΛΕΛΛΗΝΟΣ "of the King of Kings Arsaces the Renowned/Manifest Benefactor Philhellene"
Upon assuming the throne, Phraates IV eliminated rival claimants by killing and exiling his own brothers. One of them, Monaeses, fled to Antony and convinced him to invade Parthia. Antony defeated Parthia's Judaean ally Antigonus in 37 BC, installing Herod as a client king in his place. The following year, when Antony marched to Erzurum, Artavasdes II of Armenia once again switched alliances by sending Antony additional troops. Antony invaded Media Atropatene (modern Iranian Azerbaijan), then ruled by Parthia's ally Artavasdes I of Media Atropatene, with the intention of seizing the capital Praaspa, the location of which is now unknown. However, Phraates IV ambushed Antony's rear detachment, destroying a giant battering ram meant for the siege of Praaspa; after this, Artavasdes abandoned Antony's forces. The Parthians pursued and harassed Antony's army as it fled to Armenia. Eventually, the greatly weakened force reached Syria. After this, Antony lured Artavasdes II into a trap with the promise of a marriage alliance. He was taken captive in 34 BC, paraded in Antony's mock Roman triumph in Alexandria, Egypt, and eventually executed by Cleopatra VII of the Ptolemaic Kingdom. Antony attempted to strike an alliance with Artavasdes I of Media Atropatene, whose relations with Phraates IV had recently soured. This was abandoned when Antony and his forces withdrew from Armenia in 33 BC; they escaped a Parthian invasion while Antony's rival Octavian attacked his forces to the west. Following Antony's suicide in Egypt followed by that of his wife Cleopatra in 30 BC, the Parthian ally Artaxias II reassumed the throne of Armenia. Following the defeat of Antony and Cleopatra of Ptolemaic Egypt at the Battle of Actium in 31 BC, Octavian consolidated his political power and in 27 BC was named Augustus by the Roman Senate, becoming the first Roman emperor. Around this time, Tiridates II of Parthia briefly overthrew Phraates IV, who was able to quickly reestablish his rule with the aid of Scythian nomads. Tiridates fled to the Romans, taking one of Phraates' sons with him. In negotiations conducted in 20 BC, Phraates arranged for the release of his kidnapped son. In return, the Romans received the lost legionary standards taken at Carrhae in 53 BC, as well as any surviving prisoners of war. The Parthians viewed this exchange as a small price to pay to regain the prince. Augustus hailed the return of the standards as a political victory over Parthia; this propaganda was celebrated in the minting of new coins, the building of a new temple to house the standards, and even in fine art such as the breastplate scene on his statue Augustus of Prima Porta. Along with the prince, Augustus also gave Phraates IV an Italian slave-girl, who later became Queen Musa of Parthia. To ensure that her child Phraataces would inherit the throne without incident, Musa convinced Phraates IV to give his other sons to Augustus as hostages. Again, Augustus used this as propaganda depicting the submission of Parthia to Rome, listing it as a great accomplishment in his Res Gestae Divi Augusti. When Phraataces took the throne as Phraates V (r. c. 2 BC – 4 AD), Musa married her own son and ruled alongside him. The Parthian nobility, disapproving of both the incestuous relationship and the notion of a king with non-Arsacid blood, forced the pair into exile in Roman territory. Phraates' successor Orodes III of Parthia lasted just two years on the throne, and was followed by Vonones I, who had adopted many Roman mannerisms during time in Rome. The Parthian nobility, angered by Vonones' sympathies for the Romans, backed a rival claimant, Artabanus III of Parthia (r. c. 10–38 AD), who eventually defeated Vonones and drove him into exile in Roman Syria. During the reign of Artabanus III, two Jewish commoners and brothers, Anilai and Asinai from Nehardea (near modern Fallujah, Iraq), led a revolt against the Parthian governor of Babylonia. After defeating the latter, the two were granted the right to govern the region by Artabanus III, who feared further rebellion elsewhere. Anilai's Parthian wife poisoned Asinai out of fear he would attack Anilai over his marriage to a gentile. Following this, Anilai became embroiled in an armed conflict with a son-in-law of Artabanus, who eventually defeated him. With the Jewish regime removed, the native Babylonians began to harass the local Jewish community, forcing them to emigrate to Seleucia. When that city rebelled against Parthian rule in 35–36 AD, the Jews were expelled again, this time by the local Greeks and Aramaeans. The exiled Jews fled to Ctesiphon, Nehardea, and Nisibis. Although at peace with Parthia, Rome still interfered in its affairs. The Roman emperor Tiberius (r. 14–37 AD) became involved in a plot by Pharasmanes I of Iberia to place his brother Mithridates on the throne of Armenia by assassinating the Parthian ally King Arsaces of Armenia. Artabanus III tried and failed to restore Parthian control of Armenia, prompting an aristocratic revolt that forced him to flee to Scythia. The Romans released a hostage prince, Tiridates III of Parthia, to rule the region as an ally of Rome. Shortly before his death, Artabanus managed to force Tiridates from the throne using troops from Hyrcania. After Artabanus' death in 38 AD, a long civil war ensued between the rightful successor Vardanes I and his brother Gotarzes II of Parthia. After Vardanes was assassinated during a hunting expedition, the Parthian nobility appealed to Roman emperor Claudius (r. 41–54 AD) in 49 AD to release the hostage prince Meherdates to challenge Gotarzes. This backfired when Meherdates was betrayed by the governor of Edessa and Izates bar Monobaz of Adiabene; he was captured and sent to Gotarzes, where he was allowed to live after having his ears mutilated, an act that disqualified him from inheriting the throne. In 97 AD, the Chinese general Ban Chao, the Protector-General of the Western Regions, sent his emissary Gan Ying on a diplomatic mission to reach the Roman Empire. Gan visited the court of Pacorus II at Hecatompylos before departing towards Rome. He traveled as far west as the Persian Gulf, where Parthian authorities convinced him that an arduous sea voyage around the Arabian Peninsula was the only means to reach Rome. Discouraged by this, Gan Ying returned to the Han court and provided Emperor He of Han (r. 88–105 AD) with a detailed report on the Roman Empire based on oral accounts of his Parthian hosts. William Watson speculates that the Parthians would have been relieved at the failed efforts by the Han Empire to open diplomatic relations with Rome, especially after Ban Chao's military victories against the Xiongnu in eastern Central Asia. However, Chinese records maintain that a Roman embassy, perhaps only a group of Roman merchants, arrived at the Han capital Luoyang by way of Jiaozhi (northern Vietnam) in 166 AD, during the reigns of Marcus Aurelius (r. 161–180 AD) and Emperor Huan of Han (r. 146–168 AD). Although it could be coincidental, Antonine Roman golden medallions dated to the reigns of Marcus Aurelius and his predecessor Antoninus Pius have been discovered at Oc Eo, Vietnam (among other Roman artefacts in the Mekong Delta), a site that is one of the suggested locations for the port city of "Cattigara" along the Magnus Sinus (i.e. Gulf of Thailand and South China Sea) in Ptolemy's Geography. After the Iberian king Pharasmanes I had his son Rhadamistus (r. 51–55 AD) invade Armenia to depose the Roman client king Mithridates, Vologeses I of Parthia (r. c. 51–77 AD) planned to invade and place his brother, the later Tiridates I of Armenia, on the throne. Rhadamistus was eventually driven from power, and, beginning with the reign of Tiridates, Parthia would retain firm control over Armenia—with brief interruptions—through the Arsacid Dynasty of Armenia. Even after the fall of the Parthian Empire, the Arsacid line lived on through the Armenian kings. However, not only did the Arsacid line continue through the Armenians, it as well continued through the Georgian kings with the Arsacid dynasty of Iberia, and for many centuries afterwards in Caucasian Albania through the Arsacid Dynasty of Caucasian Albania. When Vardanes II of Parthia rebelled against his father Vologeses I in 55 AD, Vologeses withdrew his forces from Armenia. Rome quickly attempted to fill the political vacuum left behind. In the Roman–Parthian War of 58–63 AD, the commander Gnaeus Domitius Corbulo achieved some military successes against the Parthians while installing Tigranes VI of Armenia as a Roman client. However, Corbulo's successor Lucius Caesennius Paetus was soundly defeated by Parthian forces and fled Armenia. Following a peace treaty, Tiridates I traveled to Naples and Rome in 63 AD. At both sites the Roman emperor Nero (r. 54–68 AD) ceremoniously crowned him king of Armenia by placing the royal diadem on his head. A long period of peace between Parthia and Rome ensued, with only the invasion of Alans into Parthia's eastern territories around 72 AD mentioned by Roman historians. Whereas Augustus and Nero had chosen a cautious military policy when confronting Parthia, later Roman emperors invaded and attempted to conquer the eastern Fertile Crescent, the heart of the Parthian Empire along the Tigris and Euphrates. The heightened aggression can be explained in part by Rome's military reforms. To match Parthia's strength in missile troops and mounted warriors, the Romans at first used foreign allies (especially Nabataeans), but later established a permanent auxilia force to complement their heavy legionary infantry. The Romans eventually maintained regiments of horse archers (sagittarii) and even mail-armored cataphracts in their eastern provinces. Yet the Romans had no discernible grand strategy in dealing with Parthia and gained very little territory from these invasions. The primary motivations for war were the advancement of the personal glory and political position of the emperor, as well as defending Roman honor against perceived slights such as Parthian interference in the affairs of Rome's client states. Hostilities between Rome and Parthia were renewed when Osroes I of Parthia (r. c. 109–128 AD) deposed the Armenian king Sanatruk and replaced him with Axidares, son of Pacorus II, without consulting Rome. The Roman emperor Trajan (r. 98–117 AD) had the next Parthian nominee for the throne, Parthamasiris, killed in 114 AD, instead making Armenia a Roman province. 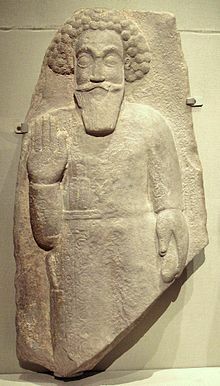 His forces, led by Lusius Quietus, also captured Nisibis; its occupation was essential to securing all the major routes across the northern Mesopotamian plain. The following year, Trajan invaded Mesopotamia and met little resistance from only Meharaspes of Adiabene, since Osroes was engaged in a civil war to the east with Vologases III of Parthia. Trajan spent the winter of 115–116 at Antioch, but resumed his campaign in the spring. Marching down the Euphrates, he captured Dura-Europos, the capital Ctesiphon and Seleucia, and even subjugated Characene, where he watched ships depart to India from the Persian Gulf. Parthian warrior, c. 100 BC–100 AD. Termez Achaeological Museum, Uzbekistan. In the last months of 116 AD, Trajan captured the Persian city of Susa. When Sanatruces II of Parthia gathered forces in eastern Parthia to challenge the Romans, his cousin Parthamaspates of Parthia betrayed and killed him: Trajan crowned him the new king of Parthia. Never again would the Roman Empire advance so far to the east. On Trajan's return north, the Babylonian settlements revolted against the Roman garrisons. Trajan was forced to retreat from Mesopotamia in 117 AD, overseeing a failed siege of Hatra during his withdrawal. His retreat was—in his intentions—temporary, because he wanted to renew the attack on Parthia in 118 AD and "make the subjection of the Parthians a reality," but Trajan died suddenly in August 117 AD. During his campaign, Trajan was granted the title Parthicus by the Senate and coins were minted proclaiming the conquest of Parthia. However, only the 4th-century AD historians Eutropius and Festus allege that he attempted to establish a Roman province in lower Mesopotamia. Trajan's successor Hadrian (r. 117–138 AD) reaffirmed the Roman-Parthian border at the Euphrates, choosing not to invade Mesopotamia due to Rome's now limited military resources. Parthamaspates fled after the Parthians revolted against him, yet the Romans made him king of Osroene. Osroes I died during his conflict with Vologases III, the latter succeeded by Vologases IV of Parthia (r. c. 147–191 AD) who ushered in a period of peace and stability. However, the Roman–Parthian War of 161–166 AD began when Vologases invaded Armenia and Syria, retaking Edessa. Roman emperor Marcus Aurelius (r. 161–180 AD) had co-ruler Lucius Verus (r. 161–169 AD) guard Syria while Marcus Statius Priscus invaded Armenia in 163 AD, followed by the invasion of Mesopotamia by Avidius Cassius in 164 AD. The Romans captured and burnt Seleucia and Ctesiphon to the ground, yet they were forced to retreat once the Roman soldiers contracted a deadly disease (possibly smallpox) that soon ravaged the Roman world. Although they withdrew, from this point forward the city of Dura-Europos remained in Roman hands. When Roman emperor Septimius Severus (r. 193–211 AD) invaded Mesopotamia in 197 AD during the reign of Vologases V of Parthia (r. c. 191–208 AD), the Romans once again marched down the Euphrates and captured Seleucia and Ctesiphon. After assuming the title Parthicus Maximus, he retreated in late 198 AD, failing as Trajan once did to capture Hatra during a siege. Around 212 AD, soon after Vologases VI of Parthia (r. c. 208–222 AD) took the throne, his brother Artabanus V of Parthia (d. 224 AD) rebelled against him and gained control over a greater part of the empire. Meanwhile, the Roman emperor Caracalla (r. 211–217 AD) deposed the kings of Osroene and Armenia to make them Roman provinces once more. He marched into Mesopotamia under the pretext of marrying one of Artabanus' daughters, but—because the marriage was not allowed—made war on Parthia and conquered Arbil east of the Tigris river. Caracalla was assassinated the next year on the road to Carrhae by his soldiers. After this debacle, the Parthians made a settlement with Macrinus (r. 217–218) where the Romans paid Parthia over two-hundred million denarii with additional gifts. The Parthian Empire, weakened by internal strife and wars with Rome, was soon to be followed by the Sassanid Empire. Indeed, shortly afterward, Ardashir I, the local Iranian ruler of Persis (modern Fars Province, Iran) from Estakhr began subjugating the surrounding territories in defiance of Arsacid rule. He confronted Artabanus V at the Battle of Hormozdgān on 28 April 224 AD, perhaps at a site near Isfahan, defeating him and establishing the Sassanid Empire. There is evidence, however, that suggests Vologases VI continued to mint coins at Seleucia as late as 228 AD. The Sassanians would not only assume Parthia's legacy as Rome's Persian nemesis, but they would also attempt to restore the boundaries of the Achaemenid Empire by briefly conquering the Levant, Anatolia, and Egypt from the Eastern Roman Empire during the reign of Khosrau II (r. 590–628 AD). However, they would lose these territories to Heraclius—the last Roman emperor before the Arab conquests. Nevertheless, for a period of more than 400 years, they succeeded the Parthian realm as Rome's principal rival. Local and foreign written accounts, as well as non-textual artifacts, have been used to reconstruct Parthian history. Although the Parthian court maintained records, the Parthians had no formal study of history; the earliest universal history of Iran, the Khwaday-Namag, was not compiled until the reign of the last Sassanid ruler Yazdegerd III (r. 632–651 AD). Indigenous sources on Parthian history remain scarce, with fewer of them available than for any other period of Iranian history. Most contemporary written records on Parthia contain Greek as well as Parthian and Aramaic inscriptions. The Parthian language was written in a distinct script derived from the Imperial Aramaic chancellery script of the Achaemenids, and later developed into the Pahlavi writing system. Parthian history can also be reconstructed via the Chinese historical records of events. In contrast to Greek and Roman histories, the early Chinese histories maintained a more neutral view when describing Parthia, although the habit of Chinese chroniclers to copy material for their accounts from older works (of undetermined origin) makes it difficult to establish a chronological order of events. The Chinese called Parthia Ānxī (Chinese: 安息, Old Chinese pronunciation: 'ansjək), perhaps after the Greek name for the Parthian city Antiochia in Margiana (Greek: Ἀντιόχεια ἡ ἐν τῇ Μαργιανῇ). However, this could also have been a transliteration of "Arsaces", after the dynasty's eponymous founder. The works and historical authors include the Shiji (also known as the Records of the Grand Historian) by Sima Qian, the Han shu (Book of Han) by Ban Biao, Ban Gu, and Ban Zhao, and the Hou Han shu (Book of Later Han) by Fan Ye. They provide information on the nomadic migrations leading up to the early Saka invasion of Parthia and valuable political and geographical information. For example, the Shiji (ch. 123) describes diplomatic exchanges, exotic gifts given by Mithridates II to the Han court, types of agricultural crops grown in Parthia, production of wine using grapes, itinerant merchants, and the size and location of Parthian territory. The Shiji also mentions that the Parthians kept records by "writing horizontally on strips of leather," that is, parchment. A bronze statue of a Parthian nobleman from the sanctuary at Shami in Elymais (modern-day Khūzestān Province, Iran, along the Persian Gulf), now located at the National Museum of Iran. By the 1st century AD, the Parthian nobility had assumed great power and influence in the succession and deposition of Arsacid kings. Some of the nobility functioned as court advisers to the king, as well as holy priests. Strabo, in his Geographica, preserved a claim by the Greek philosopher and historian Poseidonius that the Council of Parthia consisted of noble kinsmen and magi, two groups from which "the kings were appointed." Of the great noble Parthian families listed at the beginning of the Sassanian period, only two are explicitly mentioned in earlier Parthian documents: the House of Suren and the House of Karen. The historian Plutarch noted that members of the Suren family, the first among the nobility, were given the privilege of crowning each new Arsacid King of Kings during their coronations. Later on, some of the Parthian kings would claim Achaemenid descent. This has recently been corroborated via the possibility of an inherited disease (neurofibromatosis) demonstrated by the physical descriptions of rulers and from evidence of familial disease on ancient coinage. The main striking force of the Parthian army was its cataphracts, heavy cavalry with man and horse decked in mailed armor. The cataphracts were equipped with a lance for charging into enemy lines, but were not equipped with bows and arrows which were restricted to horse archers. Due to the cost of their equipment and armor, cataphracts were recruited from among the aristocratic class who, in return for their services, demanded a measure of autonomy at the local level from the Arsacid kings. The light cavalry was recruited from among the commoner class and acted as horse archers; they wore a simple tunic and trousers into battle. 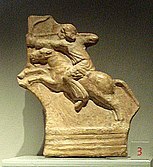 They used composite bows and were able to shoot at enemies while riding and facing away from them; this technique, known as the Parthian shot, was a highly effective tactic. The heavy and light cavalry of Parthia proved to be a decisive factor in the Battle of Carrhae where a Parthian force defeated a much larger Roman army under Crassus. Light infantry units, composed of levied commoners and mercenaries, were used to disperse enemy troops after cavalry charges. The size of the Parthian army is unknown, as is the size of the empire's overall population. However, archaeological excavations in former Parthian urban centers reveal settlements which could have sustained large populations and hence a great resource in manpower. Dense population centers in regions like Babylonia were no doubt attractive to the Romans, whose armies could afford to live off the land. Usually made of silver, the Greek drachma coin, including the tetradrachm, was the standard currency used throughout the Parthian Empire. The Arsacids maintained royal mints at the cities of Hecatompylos, Seleucia, and Ecbatana. They most likely operated a mint at Mithridatkert/Nisa as well. From the empire's inception until its collapse, drachmas produced throughout the Parthian period rarely weighed less than 3.5 g or more than 4.2 g. The first Parthian tetradrachms, weighing in principle around 16 g with some variation, appear after Mithridates I conquered Mesopotamia and were minted exclusively at Seleucia. Coin of Mithridates II of Parthia. 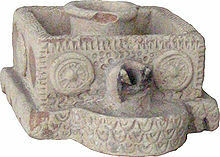 The clothing is Parthian, while the style is Hellenistic (sitting on an omphalos). The Greek inscription reads "King Arsaces, the philhellene"
Greek cultural influence did not disappear from the Parthian Empire, however, and there is evidence that the Arsacids enjoyed Greek theatre. When the head of Crassus was brought to Orodes II, he, alongside Armenian king Artavasdes II, were busy watching a performance of The Bacchae by the playwright Euripides (c. 480–406 BC). The producer of the play decided to use Crassus' actual severed head in place of the stage-prop head of Pentheus. On his coins, Arsaces I is depicted in apparel similar to Achaemenid satraps. According to A. Shahbazi, Arsaces "deliberately diverges from Seleucid coins to emphasize his nationalistic and royal aspirations, and he calls himself Kārny/Karny (Greek: Autocrator), a title already borne by Achaemenid supreme generals, such as Cyrus the Younger." 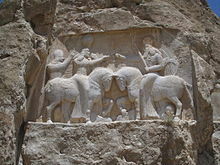 In line with Achaemenid traditions, rock-relief images of Arsacid rulers were carved at Mount Behistun, where Darius I of Persia (r. 522–486 BC) made royal inscriptions. Moreover, the Arsacids claimed familial descent from Artaxerxes II of Persia (r. 404–358 BC) as a means to bolster their legitimacy in ruling over former Achaemenid territories, i.e. as being "legitimate successors of glorious kings" of ancient Iran. Artabanus III named one of his sons Darius and laid claim to Cyrus' heritage. The Arsacid kings chose typical Zoroastrian names for themselves and some from the "heroic background" of the Avesta, according to V.G. Lukonin. The Parthians also adopted the use of the Babylonian calendar with names from the Achaemenid Iranian calendar, replacing the Macedonian calendar of the Seleucids. 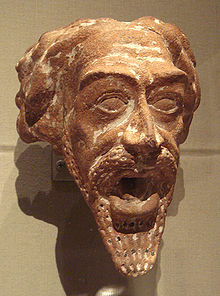 Although Mani (216–276 AD), the founding prophet of Manichaeism, did not proclaim his first religious revelation until 228/229 AD, Bivar asserts that his new faith contained "elements of Mandaean belief, Iranian cosmogony, and even echoes of Christianity ... [it] may be regarded as a typical reflection of the mixed religious doctrines of the late Arsacid period, which the Zoroastrian orthodoxy of the Sasanians was soon to sweep away." 'Parthian frontality', as we are now accustomed to call it, deeply differs both from ancient Near Eastern and from Greek frontality, though it is, no doubt, an offspring of the latter. For both in Oriental art and in Greek art, frontality was an exceptional treatment: in Oriental art it was a treatment strictly reserved for a small number of traditional characters of cult and myth; in Greek art it was an option resorted to only for definite reasons, when demanded by the subject, and, on the whole, seldom made use of. With Parthian art, on the contrary, frontality becomes the normal treatment of the figure. For the Parthians frontality is really nothing but the habit of showing, in relief and in painting, all figures full-face, even at the expense (as it seems to us moderns) of clearness and intelligibility. So systematic is this use that it amounts to a complete banishment de facto of the side-view and of all intermediate attitudes. This singular state of things seems to have become established in the course of the 1st century A.D.
A signature feature of Parthian architecture was the iwan, an audience hall supported by arches or barrel vaults and open on one side. Use of the barrel vault replaced the Hellenic use of columns to support roofs. Although the iwan was known during the Achaemenid period and earlier in smaller and subterranean structures, it was the Parthians who first built them on a monumental scale. The earliest Parthian iwans are found at Seleucia, built in the early 1st century AD. Monumental iwans are also commonly found in the ancient temples of Hatra and perhaps modeled on the Parthian style. The largest Parthian iwans at that site have a span of 15 m (50 ft). As culturally and religiously tolerant as the Parthians were, they adopted Greek as their official language, while Aramaic remained the lingua franca in the empire. The native Parthian language, Middle Persian, and Akkadian were also used. 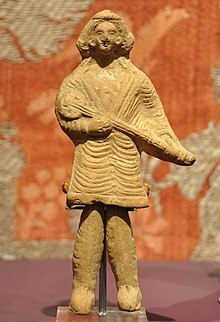 It is known that during the Parthian period the court minstrel (gōsān) recited poetic oral literature accompanied by music. However, their stories, composed in verse form, were not written down until the subsequent Sassanian period. In fact, there is no known Parthian-language literature that survives in original form, since it was written down in the following centuries. It is believed that such stories as the romantic tale Vis and Rāmin and epic cycle of the Kayanian dynasty were part of the corpus of oral literature from Parthian times, although compiled much later. Although literature of the Parthian language was not committed to written form, there is evidence that the Arsacids acknowledged and respected written Greek literature. ^ a b Fattah, Hala Mundhir (2009). A Brief History Of Iraq. Infobase Publishing. p. 46. ISBN 978-0-8160-5767-2. One characteristic of the Parthians that the kings themselves maintained was their nomadic urge. The kings built or occupied numerous cities as their capitals, the most important being Ctesiphon on the Tigris River, which they built from the ancient town of Opis. ^ Skjaervo, Prods Oktor. "IRAN vi. IRANIAN LANGUAGES AND SCRIPTS (2) Doc – Encyclopaedia Iranica". www.iranicaonline.org. Encyclopedia Iranica. Retrieved 8 February 2017. Parthian. This was the local language of the area east of the Caspian Sea and official language of the Parthian state (see ARSACIDS) and is known from inscriptions on stone and metal, including coins and seals, and from large archives of potsherd labels on wine jars from the Parthian capital of Nisa, as well as from the Manichean texts. ^ Chyet, Michael L. (1997). Afsaruddin, Asma; Krotkoff, Georg; Zahniser, A. H. Mathias, eds. Humanism, Culture, and Language in the Near East: Studies in Honor of Georg Krotkoff. Eisenbrauns. p. 284. ISBN 978-1-57506-020-0. In the Middle Persian period (Parthian and Sassanid Empires), Aramaic was the medium of everyday writing, and it provided scripts for writing Middle Persian, Parthian, Sogdian, and Khwarezmian. ^ Brosius, Maria (2006). The Persians. Routledge. p. 125. ISBN 978-0-203-06815-1. The Parthians and the peoples of the Parthian empire were polytheistic. Each ethnic group, each city, and each land or kingdom was able to adhere to its own gods, their respective cults and religious rituals. In Babylon the city-god Marduk continued to be the main deity alongside the goddesses Ishtar and Nanai, while Hatra's main god, the sun-god Shamash, was revered alongside a multiplicity of other gods. ^ From Greek Ἀρσάκης Arsakēs, from Parthian 𐭀𐭓𐭔𐭊 Aršak. ^ Waters 1974, p. 424. ^ "roughly western Khurasan" Bickerman 1983, p. 6. ^ Daryaee 2012, p. 179. ^ Bivar 1983, p. 47; Cassius Dio writes that Lucius Afranius reoccupied the region without confronting the Parthian army, whereas Plutarch asserts that Afranius drove him out by military means. ^ Bivar 1983, pp. 48–49; also, Brosius 2006, pp. 94–95 mentions this in passing. ^ Kennedy 1996, p. 80 asserts that permanent occupation was the obvious goal of the Parthians, especially after the cities of Roman Syria and even the Roman garrisons submitted to the Parthians and joined their cause. ^ Bivar 1983, pp. 60–63; Garthwaite 2005, p. 80; Curtis 2007, p. 13; see also Kennedy 1996, p. 81 for analysis on Rome's shift of attention away from Syria to the Upper Euphrates, starting with Antony. ^ See Brosius 2006, pp. 137–138 for more information on Roman coins depicting Parthians returning the lost military standards to Rome. ^ Dr. Aaron Ralby (2013). "Emperor Trajan, 98—117: Greatest Extent of Rome". Atlas of Military History. Parragon. p. 239. ISBN 978-1-4723-0963-1. ^ Kurz 1983, p. 564; see also Brosius 2006, p. 138 for further analysis: "Curiously, at the same time as the Parthian was depicted as uncivilised, he was also 'orientalised' in traditional fashion, being described as luxury-loving, leading an effeminate lifestyle, and demonstrating excessive sexuality." ^ "Strabo, Geography, Book 11, chapter 9, section 3". www.perseus.tufts.edu. Retrieved 2017-09-11. An, Jiayao (2002), "When Glass Was Treasured in China", in Juliano, Annette L. and Judith A. Lerner, Silk Road Studies: Nomads, Traders, and Holy Men Along China's Silk Road, 7, Turnhout: Brepols Publishers, pp. 79–94, ISBN 978-2-503-52178-7 . Asmussen, J.P. (1983), "Christians in Iran", in Yarshater, Ehsan, Cambridge History of Iran, 3 (2), London & New York: Cambridge University Press, pp. 924–948, ISBN 978-0-521-20092-9 . Ball, Warwick (2016), Rome in the East: Transformation of an Empire, 2nd Edition, London & New York: Routledge, ISBN 978-0-415-72078-6 . Bausani, Alessandro (1971), The Persians, from the earliest days to the twentieth century, New York: St. Martin's Press, p. 41, ISBN 978-0-236-17760-8 . Bickerman, Elias J. (1983), "The Seleucid Period", in Yarshater, Ehsan, Cambridge History of Iran, 3 (1), London & New York: Cambridge University Press, pp. 3–20, ISBN 978-0-521-20092-9 . Bivar, A.D.H. (1983), "The Political History of Iran Under the Arsacids", in Yarshater, Ehsan, Cambridge History of Iran, 3 (1), London & New York: Cambridge University Press, pp. 21–99, ISBN 978-0-521-20092-9 . Bivar, A.D.H. (2007), "Gondophares and the Indo-Parthians", in Curtis, Vesta Sarkhosh and Sarah Stewart, The Age of the Parthians: The Ideas of Iran, 2, London & New York: I.B. Tauris & Co Ltd., in association with the London Middle East Institute at SOAS and the British Museum, pp. 26–36, ISBN 978-1-84511-406-0 . Boyce, Mary (1983), "Parthian Writings and Literature", in Yarshater, Ehsan, Cambridge History of Iran, 3 (2), London & New York: Cambridge University Press, pp. 1151–1165, ISBN 978-0-521-20092-9 . Bringmann, Klaus (2007) . A History of the Roman Republic. Translated by W. J. Smyth. Cambridge: Polity Press. ISBN 978-0-7456-3371-8. Brosius, Maria (2006), The Persians: An Introduction, London & New York: Routledge, ISBN 978-0-415-32089-4 . Burstein, Stanley M. (2004), The Reign of Cleopatra, Westport, CT: Greenwood Press, ISBN 978-0-313-32527-4. Colpe, Carsten (1983), "Development of Religious Thought", in Yarshater, Ehsan, Cambridge History of Iran, 3 (2), London & New York: Cambridge University Press, pp. 819–865, ISBN 978-0-521-20092-9 . Curtis, Vesta Sarkhosh (2007), "The Iranian Revival in the Parthian Period", in Curtis, Vesta Sarkhosh and Sarah Stewart, The Age of the Parthians: The Ideas of Iran, 2, London & New York: I.B. Tauris & Co Ltd., in association with the London Middle East Institute at SOAS and the British Museum, pp. 7–25, ISBN 978-1-84511-406-0 .
de Crespigny, Rafe (2007), A Biographical Dictionary of Later Han to the Three Kingdoms (23–220 AD), Leiden: Koninklijke Brill, ISBN 978-90-04-15605-0 . Demiéville, Paul (1986), "Philosophy and religion from Han to Sui", in Twitchett and Loewe, Cambridge History of China: the Ch'in and Han Empires, 221 B.C. – A.D. 220, 1, Cambridge: Cambridge University Press, pp. 808–872, ISBN 978-0-521-24327-8 . Duchesne-Guillemin, J. (1983), "Zoroastrian religion", in Yarshater, Ehsan, Cambridge History of Iran, 3 (2), London & New York: Cambridge University Press, pp. 866–908, ISBN 978-0-521-20092-9 . Emmerick, R.E. (1983), "Buddhism Among Iranian Peoples", in Yarshater, Ehsan, Cambridge History of Iran, 3 (2), London & New York: Cambridge University Press, pp. 949–964, ISBN 978-0-521-20092-9 . Frye, R.N. (1983), "The Political History of Iran Under the Sasanians", in Yarshater, Ehsan, Cambridge History of Iran, 3 (1), London & New York: Cambridge University Press, pp. 116–180, ISBN��978-0-521-20092-9 . Garthwaite, Gene Ralph (2005), The Persians, Oxford & Carlton: Blackwell Publishing, Ltd., ISBN 978-1-55786-860-2 . Green, Tamara M. (1992), The City of the Moon God: Religious Traditions of Harran, BRILL, ISBN 978-90-04-09513-7 . Howard, Michael C. (2012), Transnationalism in Ancient and Medieval Societies: the Role of Cross Border Trade and Travel, Jefferson: McFarland & Company . Katouzian, Homa (2009), The Persians: Ancient, Medieval, and Modern Iran, New Haven & London: Yale University Press, ISBN 978-0-300-12118-6 . Kurz, Otto (1983), "Cultural Relations Between Parthia and Rome", in Yarshater, Ehsan, Cambridge History of Iran, 3 (1), London & New York: Cambridge University Press, pp. 559–567, ISBN 978-0-521-20092-9 . Lukonin, V.G. (1983), "Political, Social and Administrative Institutions: Taxes and Trade", in Yarshater, Ehsan, Cambridge History of Iran, 3 (2), London & New York: Cambridge University Press, pp. 681–746, ISBN 978-0-521-20092-9 . Mawer, Granville Allen (2013), "The Riddle of Cattigara", in Nichols, Robert; Woods, Martin, Mapping Our World: Terra Incognita to Australia, Canberra: National Library of Australia, pp. 38–39, ISBN 978-0-642-27809-8 . Mommsen, Theodor (2004) [original publication 1909 by Ares Publishers, Inc.], The Provinces of the Roman Empire: From Caesar to Diocletian, 2, Piscataway (New Jersey): Gorgias Press, ISBN 978-1-59333-026-2 . Morton, William S.; Lewis, Charlton M. (2005), China: Its History and Culture, New York: McGraw-Hill, ISBN 978-0-07-141279-7 . Neusner, J. (1983), "Jews in Iran", in Yarshater, Ehsan, Cambridge History of Iran, 3 (2), London & New York: Cambridge University Press, pp. 909–923, ISBN 978-0-521-20092-9 . Posch, Walter (1998), "Chinesische Quellen zu den Parthern", in Weisehöfer, Josef, Das Partherreich und seine Zeugnisse, Historia: Zeitschrift für alte Geschichte, vol. 122 (in German), Stuttgart: Franz Steiner, pp. 355–364 . Roller, Duane W. (2010), Cleopatra: a biography, Oxford: Oxford University Press, ISBN 978-0-19-536553-5. Schlumberger, Daniel (1983), "Parthian Art", in Yarshater, Ehsan, Cambridge History of Iran, 3 (2), London & New York: Cambridge University Press, pp. 1027–1054, ISBN 978-0-521-20092-9 . Sellwood, David (1983), "Parthian Coins", in Yarshater, Ehsan, Cambridge History of Iran, 3 (1), London & New York: Cambridge University Press, pp. 279–298, ISBN 978-0-521-20092-9 . Wang, Tao (2007), "Parthia in China: a Re-examination of the Historical Records", in Curtis, Vesta Sarkhosh and Sarah Stewart, The Age of the Parthians: The Ideas of Iran, 2, London & New York: I.B. Tauris & Co Ltd., in association with the London Middle East Institute at SOAS and the British Museum, pp. 87–104, ISBN 978-1-84511-406-0 . Waters, Kenneth H. (1974), "The Reign of Trajan, part VII: Trajanic Wars and Frontiers. The Danube and the East", in Temporini, Hildegard, Aufstieg und Niedergang der römischen Welt. Principat. II.2, Berlin: Walter de Gruyter, pp. 415–427 . Watson, William (1983), "Iran and China", in Yarshater, Ehsan, Cambridge History of Iran, 3 (1), London & New York: Cambridge University Press, pp. 537–558, ISBN 978-0-521-20092-9 . Widengren, Geo (1983), "Sources of Parthian and Sasanian History", in Yarshater, Ehsan, Cambridge History of Iran, 3 (2), London & New York: Cambridge University Press, pp. 1261–1283, ISBN 978-0-521-20092-9 . Wood, Frances (2002), The Silk Road: Two Thousand Years in the Heart of Asia, Berkeley and Los Angeles: University of California Press, ISBN 978-0-520-24340-8 . Yarshater, Ehsan (1983), "Iranian National History", in Yarshater, Ehsan, Cambridge History of Iran, 3 (1), London & New York: Cambridge University Press, pp. 359–480, ISBN 978-0-521-20092-9 . Yü, Ying-shih (1986), "Han Foreign Relations", in Twitchett, Denis and Michael Loewe, Cambridge History of China: the Ch'in and Han Empires, 221 B.C. – A.D. 220, 1, Cambridge: Cambridge University Press, pp. 377–462, ISBN 978-0-521-24327-8 . Young, Gary K. (2001), Rome's Eastern Trade: International Commerce and Imperial Policy, 31 BC - AD 305, London & New York: Routledge, ISBN 978-0-415-24219-6 . Zhang, Guanuda (2002), "The Role of the Sogdians as Translators of Buddhist Texts", in Juliano, Annette L. and Judith A. Lerner, Silk Road Studies: Nomads, Traders, and Holy Men Along China's Silk Road, 7, Turnhout: Brepols Publishers, pp. 75–78, ISBN 978-2-503-52178-7 . Daryaee, Touraj (2012). The Oxford Handbook of Iranian History. Oxford University Press. pp. 1–432. ISBN 978-0-19-987575-7. Wikimedia Commons has media related to Parthia.